Now on to the cookies! 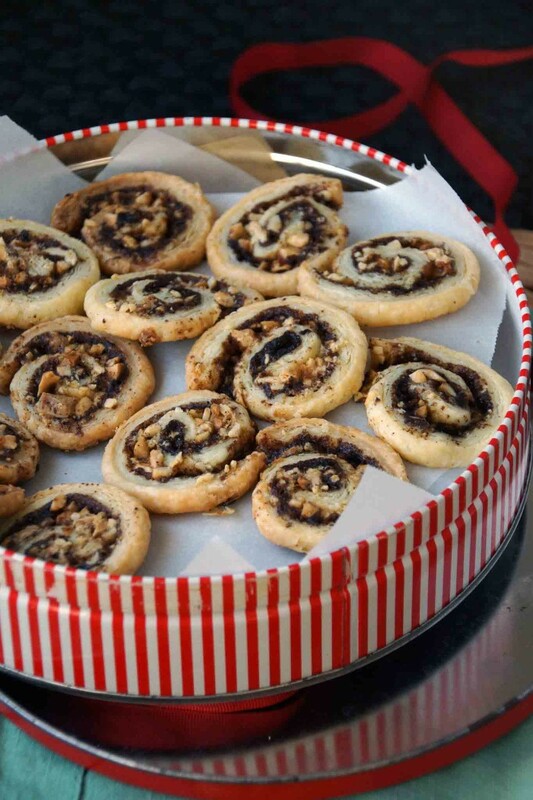 I used a rugelach dough as my base and rolled it with white chocolate, espresso powder, and toasted hazelnuts to make pinwheels. The result was a subtly sweet, absolutely delicious, cookie. The buttery dough bakes up rich and flaky. White chocolate melts into the espresso and hazelnuts, caramelizing and adding a touch of crunch. All that adds up to my new favorite treat to enjoy with a cup of coffee. Most of your ingredient list is in the title of the cookies. You’ll need a bar of decent to good white chocolate, instant espresso powder, and hazelnuts, plus sugar, flour, cream cheese, and butter. I used Dorie Greenspan’s rugelach dough recipe for the base of the cookies. It’s a dead simple recipe that I now have committed to memory, which could end up being dangerous. Just measure out a cup of flour, toss it in the food processor with a pinch of salt. Cut a stick of butter and half a block of cream cheese in chunks, scatter them over the flour, and pulse until clumps of dough form. Dump it out, smash it all together, wrap in plastic, and chill. Let the dough chill for a couple of hours. While it chills, prep your ingredients for the filling. 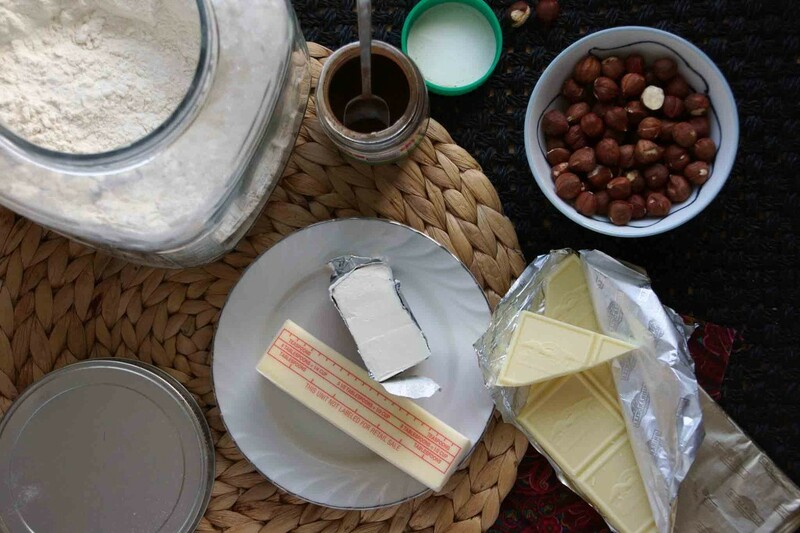 Toast, skin, and chop some hazelnuts, mix espresso with sugar; shatter a bar of white chocolate, and melt a pat of butter. Now we’ll put it all together. 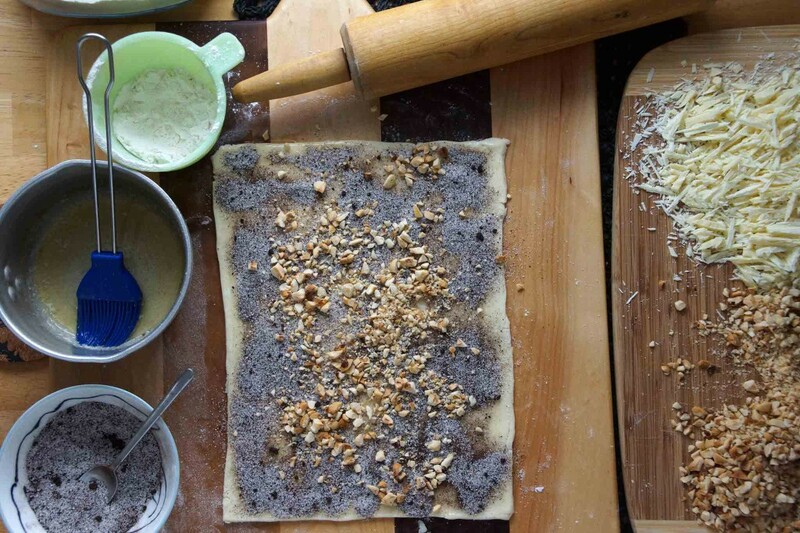 Roll each piece of dough into a rectangle about the size of a sheet of paper. Brush the dough with melted butter and sprinkle with the espresso and sugar mixture. Scatter the hazelnuts and white chocolate bits over the espresso and use your palms to gently press the toppings into the dough. 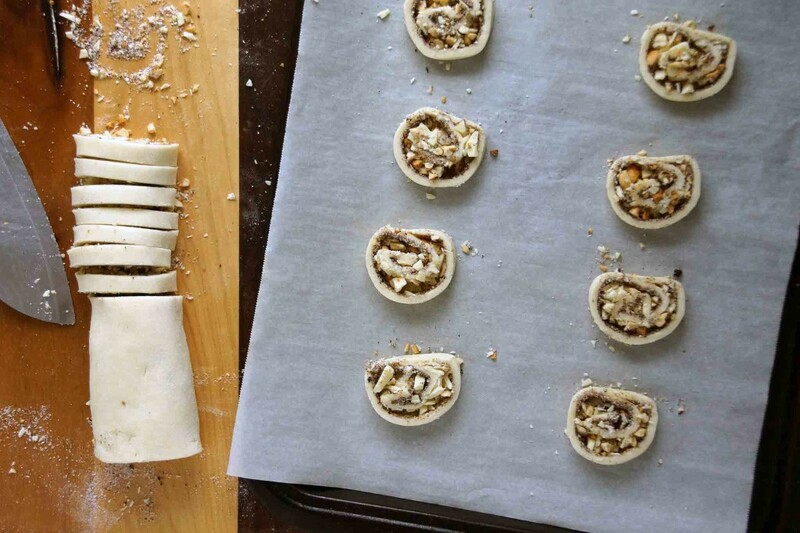 After the rolled dough has chilled and firmed up, cut each log crosswise in 1/4 inch intervals with your sharpest knife and transfer the cookies to a baking sheet. 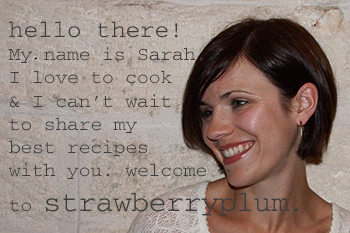 Some of the filling is bound to tumble out as you make the transfer–don’t sweat it (or curse my name! )–just sprinkle whatever spilled out over the cookies before you pop them in the oven. Bake until the cookies are golden and your entire house is filled with the scent of strong coffee and, uh, melted candy bars. Smelling these cookies bake is almost as good as biting into one. Almost. These cookies are a perfect 2-bite treat with a cup of coffee. Don't be intimidated by the lengthy instructions. You can certainly make the dough a day ahead or put the cookie logs in the freezer to be baked off whenever you need them. 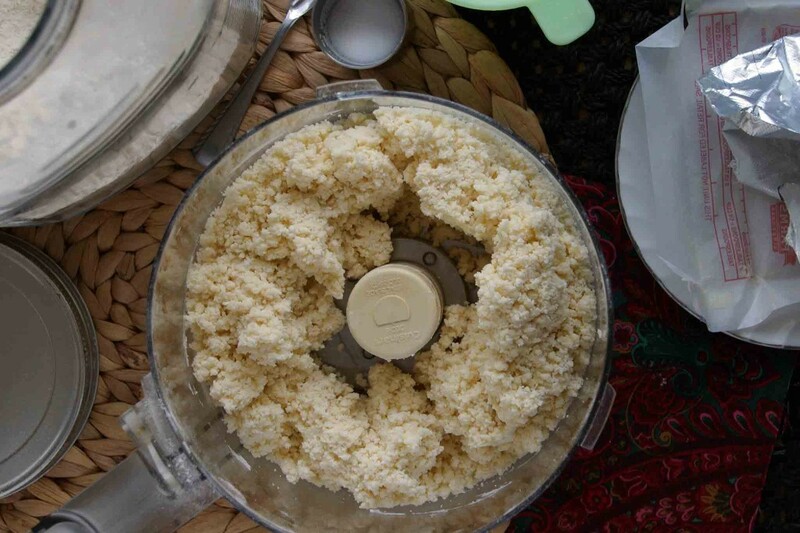 Combine flour and salt in the bowl of a food processor and pulse a few times to incorporate. 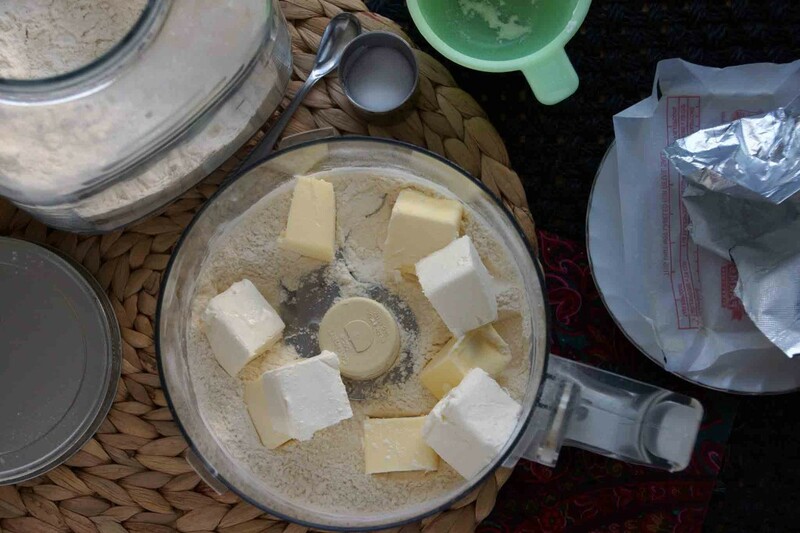 Scatter the chunks of butter and cream cheese over the flour and pulse in 1 second bursts until clumps of dough form (don't process until the dough comes together in a ball). Dump the clumps of dough onto a counter or board, divide in half, and press each half together into a 1-inch thick rectangle. 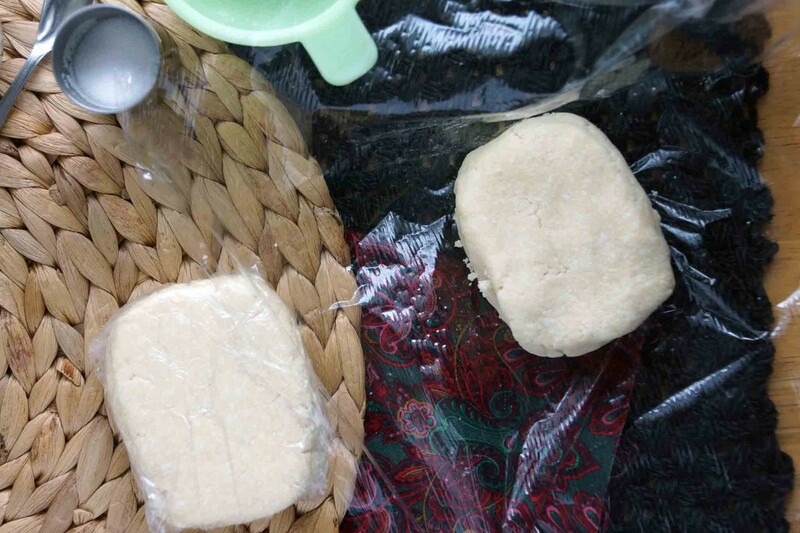 Wrap tightly with plastic wrap and refrigerate for 2 hours or more. Meanwhile, prep the ingredients for the cookie filling. Toast, skin, and finely chop the hazelnuts. In a small bowl, stir together the sugar and espresso powder. Chop the white chocolate into fine slivers. Melt the remaining 2 Tbsp. of butter and allow to cool slightly. To form the cookies, flour a counter or board and roll a piece of dough into an 8 in. X 10 in. rectangle. If you chilled your dough for more than a couple of hours, you might have to let it warm slightly before you are able to accomplish this task. Brush the dough with the melted butter. The butter with act as glue (and add extra buttery deliciousness, of course!) to adhere the espresso. Sprinkle half or the sugar-espresso mixture over the butter, followed by half of the hazelnuts and half of the white chocolate. Try to keep the toppings fairly even. 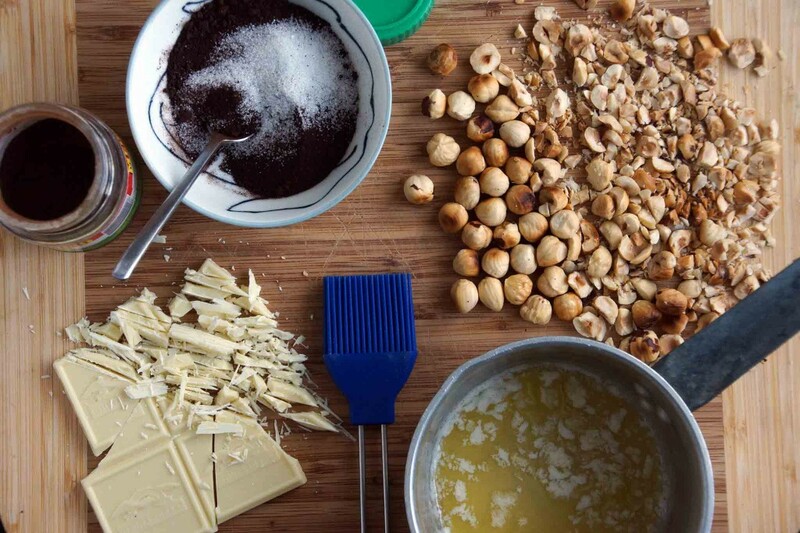 Using your palms, gently press the chocolate and hazelnuts into the dough. 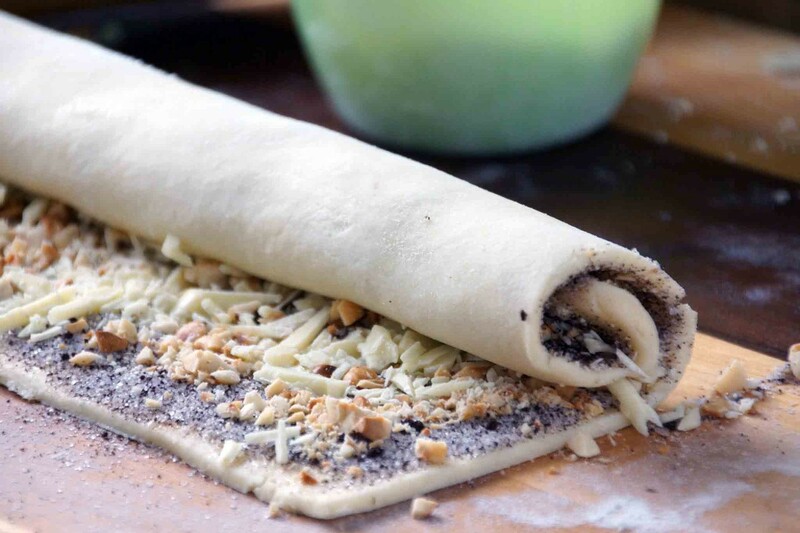 Now, with the long side of the rectangle closest to you, roll the dough into a log. Repeat with the second piece of dough and remaining ingredients. Let the logs rest on their seams in refrigerator for at least 30 minutes before slicing and baking. Preheat oven to 350° and line baking sheets with parchment paper. Using a very sharp knife, slice the chilled cookie dough logs crosswise in ¼ in. intervals. Carefully transfer the cookies to the prepared baking sheets. 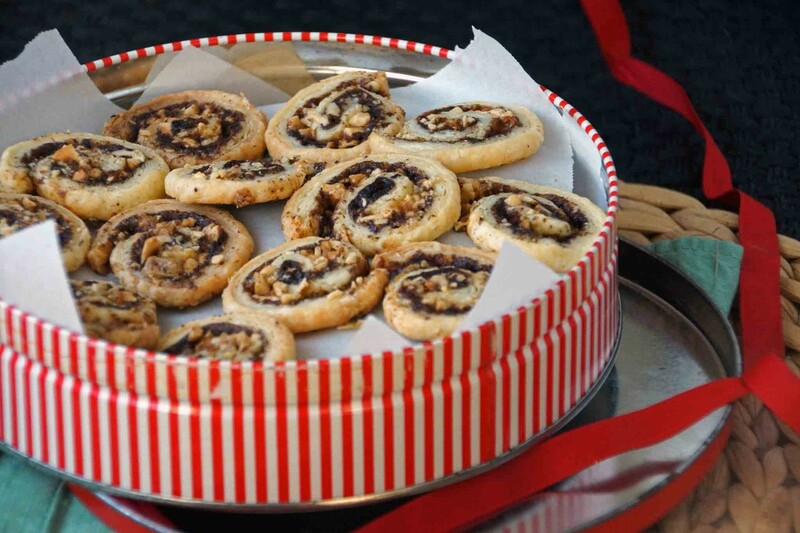 You might lose a few hazelnuts along the way--just sprinkle them over the tops of the cookies. Bake until the cookies are lightly golden, about 15 minutes, rotating the pans halfway through. Transfer the cookies to wire racks to cool. Make sure to have one (okay, a couple) while they're still warm. The remaining cookies can be stored in an airtight container at room temperature and will keep well for a few days. And a special thanks to Balthazar’s Keuken in Amsterdam for a great dinner and inspiring these cookies! 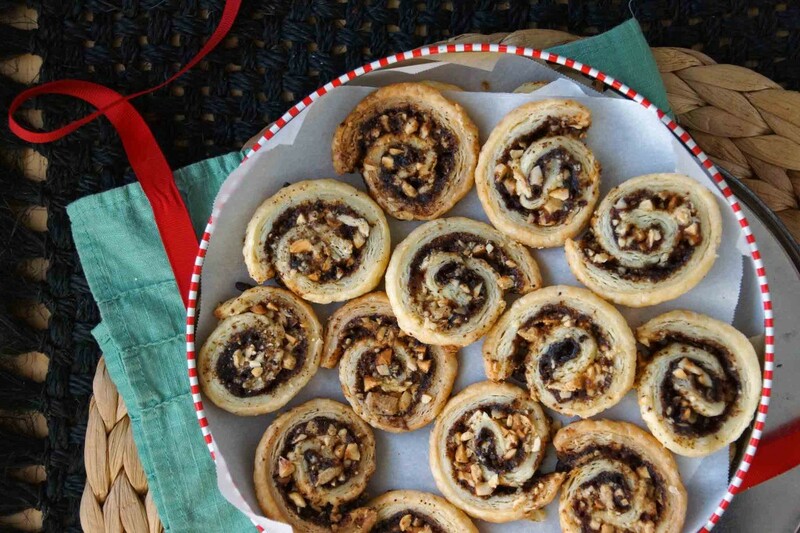 These look sooooo good – any time of the year! These look amazing.. I never use/eat white chocolate, probably for the same reasons you didn’t either. I will have to check this out.